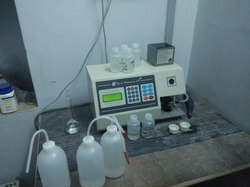 We have our own laboratory in which each and every material is tested properly. Without testing of any material our dispatch team doesn''t allow the material to be stuffed into bags. While production samples of every 30 Mins. are taken carefully and are tested in order to maintain consistency, quality and proper material. We have machines imported from various countries like China, Japan, Korea, Germany, Europe and Few Indian also. The laboratory scientist are highly qualified and well experienced in testing of Feldspar and Quartz and they check each and every component before passing any material. Quality and innovation are the hallmarks of our products. We believe in constant improvement of our quality standards in order to make our products as per national norms. Our products are made from the superior quality raw materials sourced from well-established and reputed suppliers to ensure flawless manufacturing process. Our work policy is to maintain a strict quality management system with checks and control manufacturing procedures. Our team of quality control inspectors checks each and every manufacturing process, from procurement of the raw material to the packaging of the finished products.